My name is Joni, and I’m a sucker for rainbow quilts. In fact, I’m working on so many right now I’m going to need to do something completely different soon to break out of it. That doesn’t mean I resisted joining in on the Sunset Isle quilt along hosted by Alyce of Blossom Hearts Quilts. And so here I find myself giving you a four-block update on my progress so far. Before I get into the pretty block pictures, I’m proud that every single fabric in this quilt came from my stash! I’ve been working really hard to “shop” from the stash first, and I’m really happy with how this is going to look. 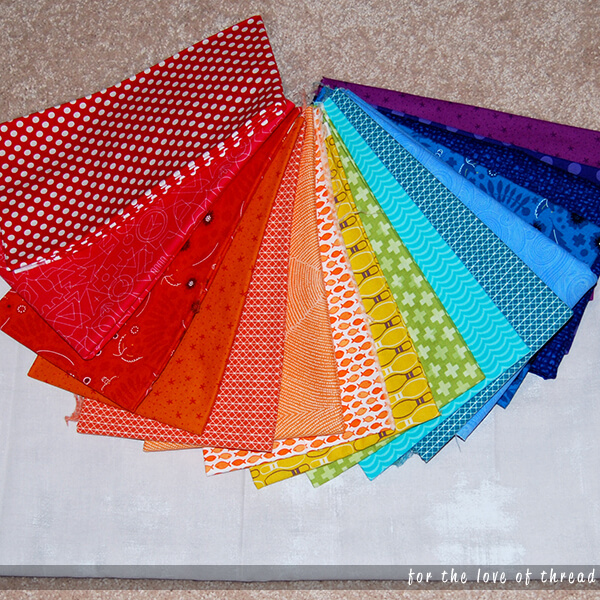 I just love it when I have all the perfect fabrics for a quilt just lying around in my stash!